Gil Parker knows a thing or two about hiking and rock climbing. A climber for 45 years, he has bagged several hundred summits in the United States, India, Nepal, Russia, Georgia and Canada, with most of his homegrown climbs in the Rockies and on Vancouver Island. His vast outdoor experience was put to good use as a former western vice president of the Alpine Club of Canada, of which he is a life member. Now he is also president and founder of the Vancouver Island Spine Trail Association (VISTA). Parker first came to Vancouver Island in the late 1960s, but it was the six-year period from 1999 to 2004 that was a pivotal time for Parker and his future ambitions. During that period, he hiked approximately 85 per cent of the 4,300 km Pacific Crest Trail from Mexico to Canada. It was also during this time that he developed the idea for the VI Spine for Vancouver Island—a 700-km public non-motorized trail system running from Victoria to Cape Scott. His vision of the Spine Trail began with creating a challenge for long-distance hikers, but rapidly expanded to include non-motorized travellers such as runners, mountain bikers and equestrians in suitable areas. 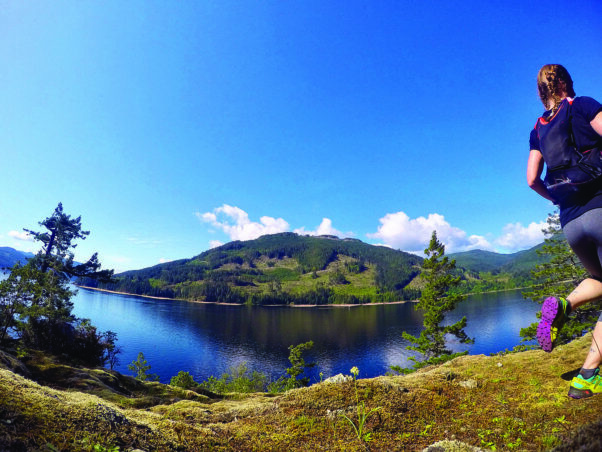 The resulting concept links many existing trails, joined in continuity by new sections, to provide athletic and healthful challenges to citizens of Vancouver Island and to increase tourism interest and development. The project is being developed by VISTA, a part of “Hike BC”, the BC wing of the National Hiking Trail (NHT). Over the past 30 years the NHT has incorporated such significant trails as the East Coast Trail in Newfoundland, the Bruce Trail in Ontario, the Alexander MacKenzie route, and the Nuxalk/Carrier “Grease Trail” from Bella Coola to Quesnel. The VI Spine trail does not have the historical cachet of the Camino de Santiago in Spain, or the notoriety of the 2,200 mile Appalachian Trail, which runs along the eastern US from Georgia to Maine. At the same time, however, the VI Spine provides unique exposure to the concept of a “working forest” in some areas, and in others to untouched wilderness equally beautiful and challenging to any of the world’s great trails. The route traces mountain ridges, passes through forests and alongside lakes. Many Island residents are unaware of their own mountain environment or the far reaches of northern lakes. “Often they become aware of their own special hinterland only through reports of overbooking of the West Coast Trail, or increasing tourist use of the North Coast Trail,” says Parker. VISTA’s director of operations, Terry Lewis, agrees. Lewis became a Director in 2014 after acting as an informal representative in the Comox Valley for several years. The last decade has seen him busy building trails on the slopes above the Comox Valley for both mountain bikers and hikers. Accordingly, it was a natural segue for him to get involved with Spine Trail operations. An ostensibly humble man, he speaks with contagious enthusiasm and the assurance of knowing the trail will succeed in becoming one of the standout trails in all of North America. VISTA is employing three different strategies to build trails, including use of existing trail, collaborating with local organizations, and starting from scratch. A collaborative approach is proving beneficial as it spreads the project workload, but working from scratch will be used extensively, particularly in some areas north of Campbell River. Each section of the Spine Trail has to be approved by regulatory bodies and/or landowners, which can be a slow moving process. As such, much of the early efforts were directed at gaining access to existing trails. There are five proposed sections of the Spine Trail. Section One is from Victoria to Cowichan Lake, starting at Clover Point and following the Trans Canada Trail to the town of Lake Cowichan. Currently there are gaps in the trail along the Malahat and along the south side of Cowichan Lake. Section Two of the trail heads from Cowichan Lake to Port Alberni, and includes the Tuck Lake Trail, Runner’s Trail and Alberni Inlet Trail. Section Three starts with the Log Train Trail and then winds along the crest of the Beaufort Mountains to Cumberland, although the exact route through this stretch has not been decided on. Section Four runs from Cumberland to Strathcona Dam, west of Campbell River, from the Puntledge River along Forbidden Plateau, climbing Mt. Becher into Strathcona Park then northwards along the ridge east of Buttle and upper Campbell Lakes. The final section from Strathona Dam to Woss and then onto Cape Scott is less defined, although VISTA has recently completed a feasibility study to locate a suitable route from Strathcona Dam to Port McNeill and on to Port Hardy. From this point, the trail will run north to Shushartie Bay then link up with the existing North Coast Trail to the end point at Cape Scott. Early on, the Board of VISTA made a decision to limit the amount of work on trails on traditional areas to planning and flagging only, with detailed trail construction and clearing to occur only after support of the project is indicated by the appropriate First Nation. In initial sections of the VI Spine Trail work in 2011, contacts were made with the Ditidaht First Nation prior to work on the Tuck Lake Trail west of Cowichan Lake. VISTA requested information on any archaeological sites or cultural values of the land traversed. Later, VISTA worked with the Tseshaht First Nation to connect the trail to the Runners Trail—constructed in 2012—and has carried out trail maintenance subsequent to that time. Comox Valley ultra marathon runner Sarah Seads is a huge advocate of the Spine Trail. Throughout this year Seads, the owner and founder of local fitness business Equilibrium Lifestyle Management (ELM), will be exploring and documenting sections of Spine Trail. 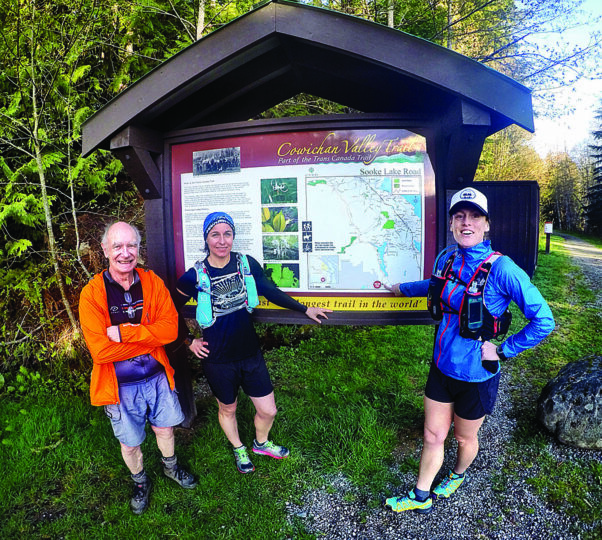 As new sections of trail are completed, Seads will be running deeper and deeper into the heart of Vancouver Island, documenting each leg and creating trail reports to help others plan and complete their own adventures on the trail. Seads just completed her second adventure on the trail—a 37 km jaunt from Port Alberni Inlet to the Log Train Trail, a mostly undulating single track with some short technical sections requiring scrambling over rock. “What an absolutely beautiful trail!” she says. “Very few people on Vancouver Island know about this trail network and even fewer tend to make it out to this stage of the Alberni Inlet Trail. The extra drive and shuttling required to make this route a point to point makes it a bit more challenging to access but it is worth it. This leg of the Alberni Inlet Trail was absolutely breathtaking. Seads’ ultimate goal is to raise awareness of the Vancouver Island Spine Trail Association and their epic 700 km trail vision. For more information about the Vancouver Island Spine Trail and how you can help make VISTA’s vision a reality, visit vispine.ca.